This mantra is a guiding principle of Dr. Alexis Boylan in co-organizing UConn’s Art+Feminism Edit-a-thon. Founded on the weekend of International Women’s Day in 2014, this annual event called upon participants at dozens of locations worldwide to edit and create Wikipedia articles on women and the arts. The event aims to address inequalities that have existed in women’s representation on the site. To help fix this problem, UConn will host their own Edit-a-thon on March 6, and students, faculty and other members of the UConn community will work tirelessly for eight hours to give women artists more visibility on the web. Boylan, who is an assistant professor of Art & Art History and Women’s, Gender, and Sexuality Studies (WGSS) believes it is a great opportunity for members of the UConn community to make a difference. Since Wikipedia is crowdsourced, said Boylan, it has been representative of society for a long period of time. The Edit-a-thon is looking to have members of the UConn community do something about it. Boylan added that, especially in the past two years, members of the UConn community have been a presence in the conversation about education and diversity, and this event will be another way to demonstrate leadership in this area. Faculty, students and anyone who is interested are invited to attend the Edit-a-thon on Sunday, March 6, from 11 a.m. to 6 p.m. in Electronic Classroom 2 at Homer Babbidge Library. In case you weren’t already tempted enough, the event is free and pizza will be provided. Participants are not required to stay for the entire Edit-a-thon, and they may bring a laptop to use if they wish, but it is not required. No technical experience is needed, according to Kathy Labadorf, WGSS Librarian and co-organizer of the event with Boylan. A wide variety of skills are needed including research and editing, and staff will be on-hand for assistance. Boylan and Labadorf hope that the impact of the event will reach far beyond the day itself. “Wikipedia is a living entity, and you can still participate long after the event by editing and adding articles,” said Boylan. “In today’s world, education is about being a contributor as well as a receiver of information, and this event promotes that,” Labadorf said. To RSVP for the event, please visit the Storrs Edit-a-thon Wikipedia page. There, you can register for the event as well as add suggestions to the list of articles that need improvement or expansion. Researchers – Get Your Data On! Want to learn about some of the tools out there to help effectively manage and analyze your research data? Ever wondered what OpenRefine, Introduction to R, Data analysis and visualization in R and SQL for data management can do for you? 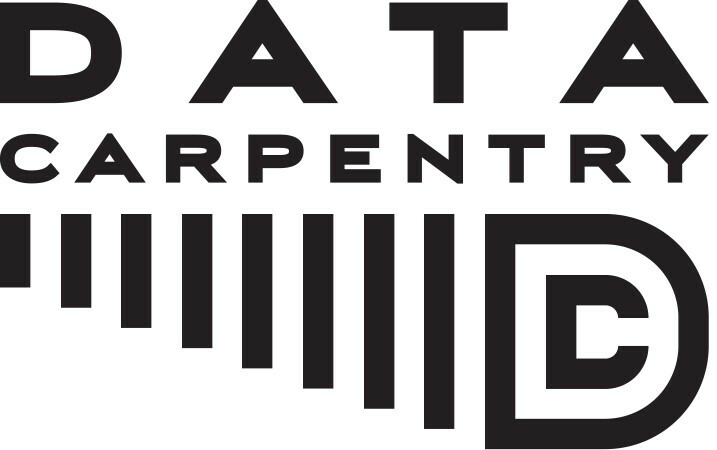 Join us for a two-day Data Carpentry workshop on Mar 7-8 from 9:00 am-4:30 pm and explore basic concepts, skills and tools for working more effectively with data. This will be focused on ecology/natural resources research data but anyone is welcome to attend. UConn participants can register for either the UConn Associate or the General seats. Registration and laptops with specific software are required. Information on both of these be found on the Data Carpentry website. On March 21-22 we will offer a second two-day workshop that will focus on the basic concepts and tools for your research, including program design, version control, data management, and task automation. This will also be focused on ecology/natural resources research data. UConn participants can register for either the UConn Associate or the General seats. Registration and laptops with specific software are required. Information can be found on the Software Carpentry website. The UConn Libraries is pleased to be partnering with the Women’s, Gender and Sexuality Studies Program on their upcoming discussion this March. The very meanings of race, of gender, of sexuality, of labor and reproduction, of power, justice, and even of survival itself might not change after the apocalypse; then again, they might. 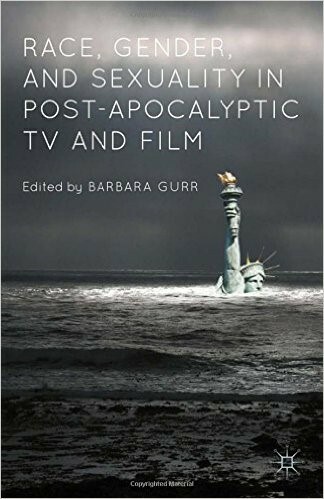 Dr. Stacy Missari (Quinnipiac University) and Dr. Mary Burke (University of Vermont) will join Dr. Barbara Gurr (UConn) for a salon that focuses on what popular culture teaches us about post-apocalyptic politics and the human imagination. 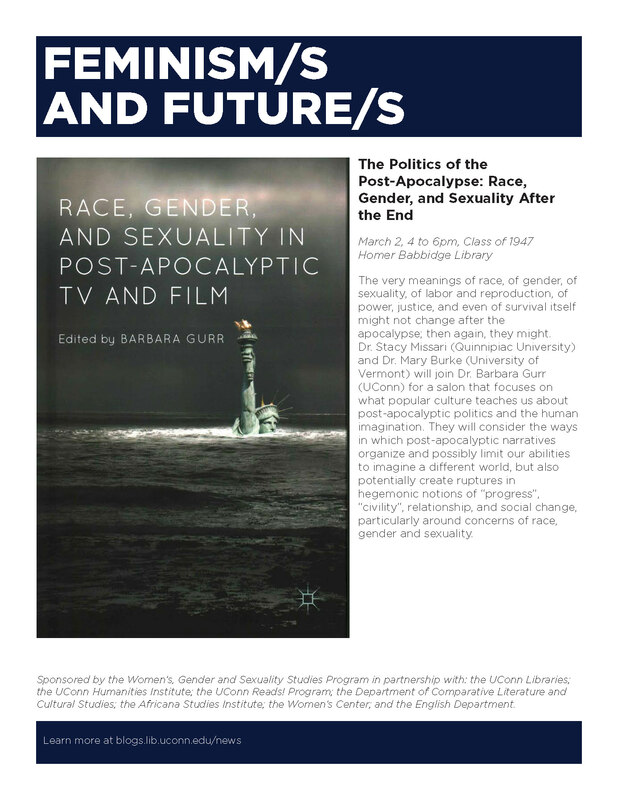 They will consider the ways in which post-apocalyptic narratives organize and possibly limit our abilities to imagine a different world, but also potentially create ruptures in hegemonic notions of “progress”, “civility”, relationship, and social change, particularly around concerns of race, gender and sexuality. All organizing is science fiction. A world where everyone has a home, a great education, community based transformative justice, nourishing food to eat and clean water to drink, where we are in right relation to the planet, to each other, where are free to be and love ourselves as we are, to grow together? We have never seen it; its possibility remains speculative. Yet speculative fiction, perhaps particularly science fiction, offers a powerful opportunity to speculate-into-being. 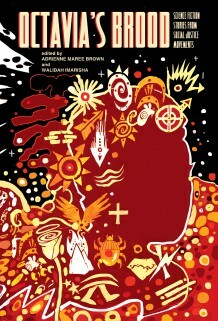 Adrienne Maree Brown, co-editor of Octavia’s Brood: Science Fiction Stories from Social Justice Movements (AK Press 2015), will facilitate a salon focused on the history of science fiction and social change, considering ways to use science fiction as a practice ground for social justice strategizing and vision. Both salons are sponsored by the Women’s, Gender and Sexuality Studies Program in partnership with: the UConn Libraries; the UConn Humanities Institute; the UConn Reads! Program; the Department of Comparative Literature and Cultural Studies; the Africana Studies Institute; the Women’s Center; and the English Department. UConn students and faculty can now visit the pyramids at Giza, the Amazon rainforest, or the Roman Coliseum all without ever leaving the library. A Google Liquid Galaxy has just been installed at Homer Babbidge, located on the first floor near the computers, replacing what was previously a print station. It consists of a center console with five monitors facing you in a semi-circle. Users can type in locations on the touch screen and instantly view places around the world in this immersive Google Earth experience. “It’s like seeing the world without actually taking a vacation,” said Alec Suprenant, an undergraduate senior who works in library’s IT department and helped with the installation of the technology. Other universities are beginning to implement the technology as well, and can provide inspiration to students at UConn as they come up with innovative ways to use the Liquid Galaxy. For example, an art history professor at UNC Chapel Hill is using it to better understand the landscape where a medieval aviation experiment took place. Many different subject areas can find uses for the Liquid Galaxy. For example, geography students can get the literal “lay of the land” and map out changes over time. Those interested in urban planning or architecture can look at cities around the world, while history classes can visit faraway historical sites with a touch of a button. 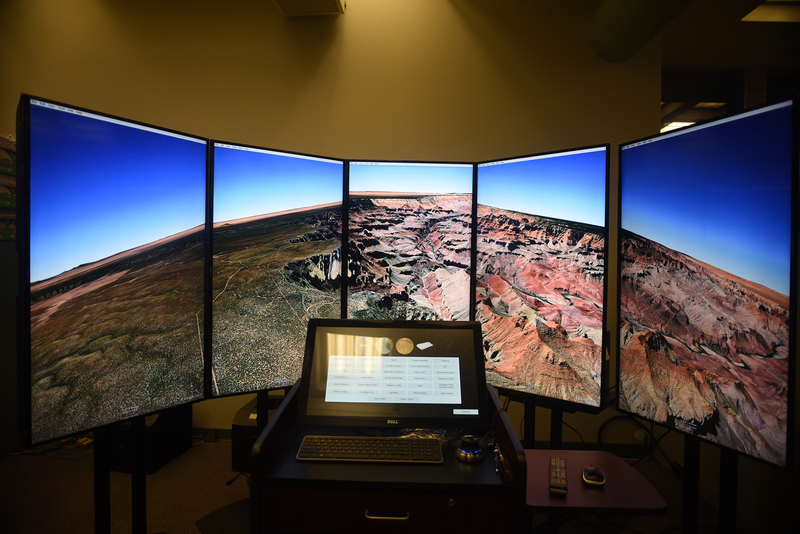 Archaeology professors can virtually transport students to a dig site. Journalism students can even do research or fact checking for their stories by virtually visiting other locations, like the professional journalists at Storyful.com do. The Liquid Galaxy is sure to inspire future research projects, educational presentations, and new ways of learning and teaching. Many industries are also starting to employ the technology, so students can benefit from learning how to use it early on. For example, real estate companies have been able to virtually showcase properties, and tourism and hospitality workers can give guests an inside look at various resorts and vacation spots. Or, if none of this appeals to you, looking up your house is always fun. “I would estimate that when people first see the Liquid Galaxy, about 60 to 70 percent of them look up their house first,” said Suprenant.